(GR/GCO) (Washington-Dulles, Miami and New York-JFK) 1995 - 2008. Photos. Framable Color Prints and Posters. Digital Sharp Images. Aviation Gifts. Slide Shows. 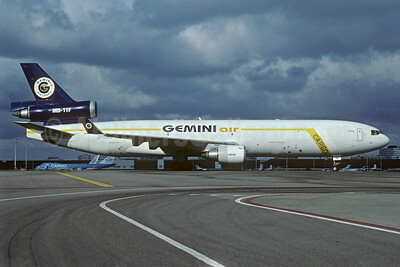 Gemini Air Cargo McDonnell Douglas DC-10-30 (F) N601GC (msn 47921) BSL (Christian Volpati Collection). Image: 941237. 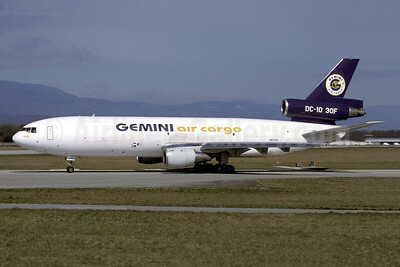 Airline Color Scheme - Introduced 1995 - Named "Debra"
Gemini Air Cargo McDonnell Douglas DC-10-30 (F) N606GC (msn 47929) MIA (Bruce Drum). Image: 100136. 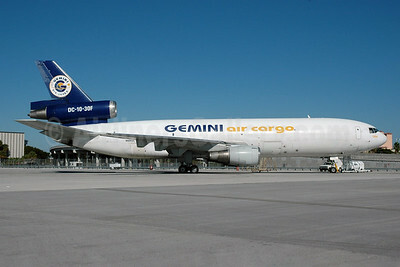 Gemini Air Cargo McDonnell Douglas MD-11 (F) N705GC (msn 48412) AMS (Christian Volpati Collection). Image: 939175.